If you’ve been reading these pages for a few years now, you might recognize Eastern Spirit Garage from Poland. 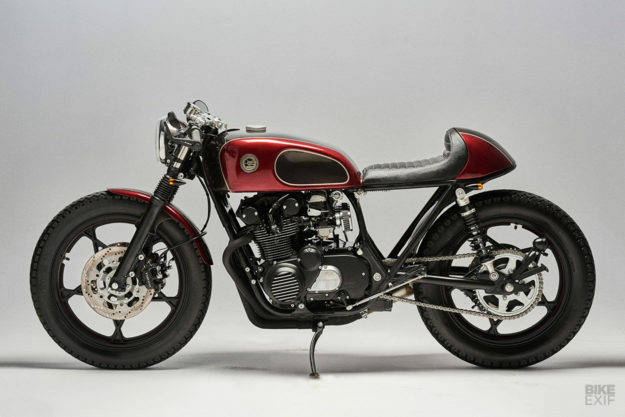 Every year or so, Sylwester turns out a beautifully constructed custom from often unpromising source material—notably the Honda CX500 or Suzuki’s GS series. 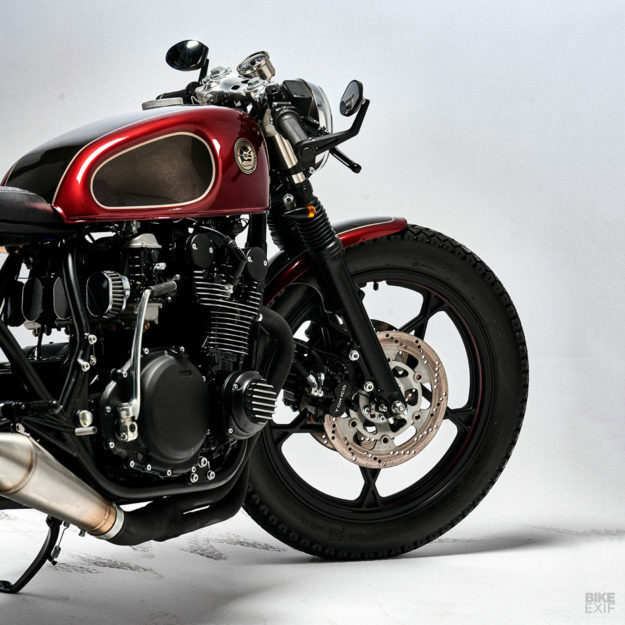 He has an eye for a good line; a CX500 from five years ago was a textbook example of a modern day cafe racer. 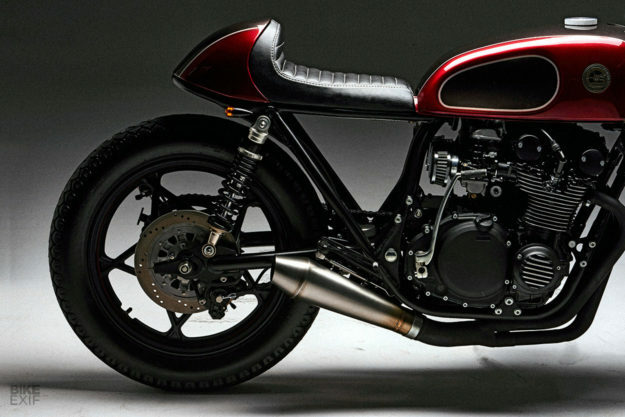 Industrial designer Charlie Trelogan even used it for his seminal piece on cafe racer styling. 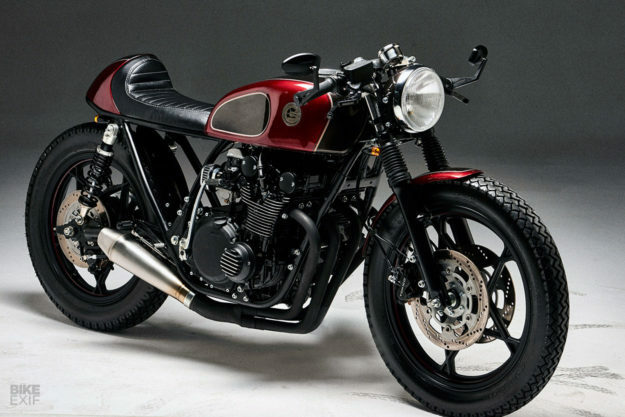 Eastern Spirit are now back with a new build, a GS550 inspired by a similar Suzuki that was a huge hit on EXIF a year ago. “We put the blue GS on display in Warsaw and our client Zbyszek saw it,” says Sylwester. The GS series was Suzuki’s first foray into four-stroke engine technology—and they got it right straight off the bat. The GS750 big brother was a favorite with road testers, and the GS550 was no slouch either: it was faster than the Honda CB550F Super Sport and even Suzuki’s own GT550 two-stroke. Unfortunately, any GS still on the road these days is likely to be pretty tired, and so was the donor bike that Eastern Spirit finally managed to locate. 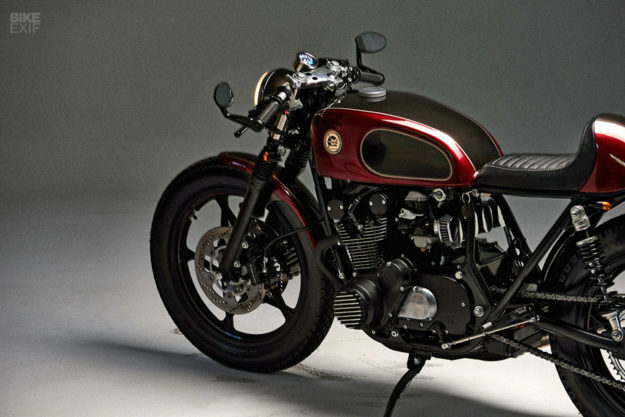 So they tore down and rebuilt the 549 cc inline four, restoring the brisk original performance. There’s a full complement of new gaskets and seals, plus new valves and piston rings, and a new clutch. A coat of gleaming high-temperature metallic black paint makes sure the outside looks as good as the inside. The suspension has been rebuilt too, with shortened forks fitted with new internals and shorter and stiffer springs. Leveling out the stance are new YSS shocks at the rear. 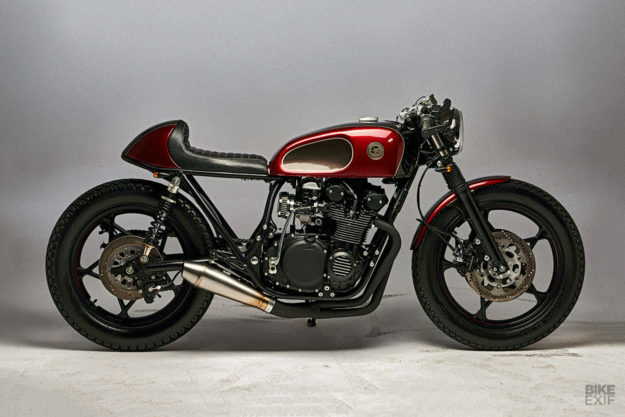 The stock GS550 brakes were good for the day, but Eastern Spirit have gone for an upgrade with twin floating discs at the front—from a GSF750 Bandit, they suspect—fed by a front master cylinder is from a Honda VFR. At the back are Tokico two-piston calipers from a Bandit 600, in full view thanks to the short, hand-made muffler, and hooked up to a Yamaha R1 master cylinder. Getting the brakes and reservoir to fit meant rebuilding the swingarm. 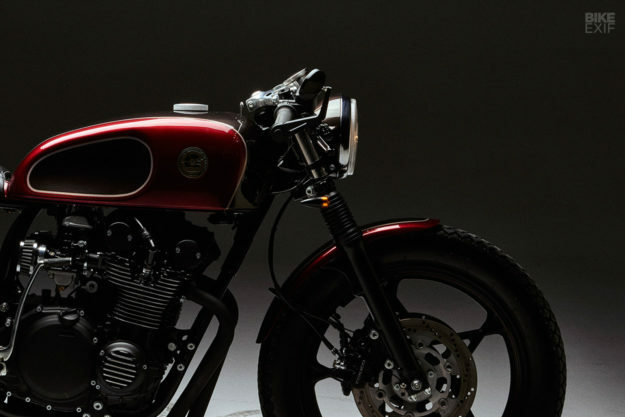 Visual distractions are minimized: there’s a simple Daytona speedo, the electrics are well hidden, the footpegs are custom-made and there are simple new aftermarket levers on the bars, modified to fit. 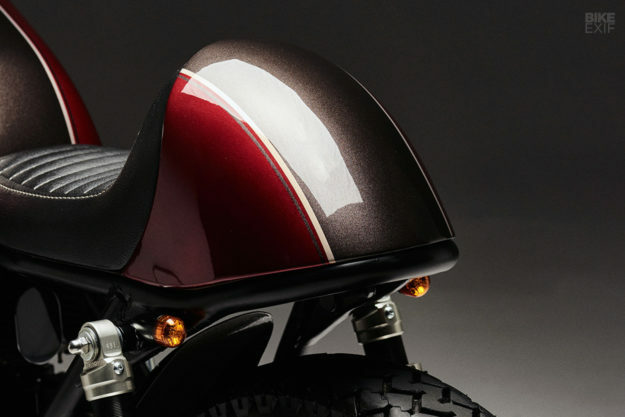 The tank and the new tail unit are finished in seven layers of Rolls-Royce paint, for a remarkably lustrous finish, topped off with a simple knurled fuel cap. The effect is sharp and luxurious. And as crisp as a cold shot of the Belvedere vodka made a few kilometers to the east of Sylvester’s workshop. More, please.